Bright and cheerful these happy elves are taking a break from Santa's workshop. Personalize for grandparents, family, friends, or whatever will fit on the white banner. 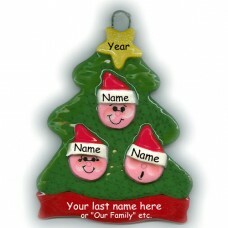 These three elves will make a great gift or a charming addition to your own tree. 4" tall x 4" wide.